Driving a saturable inductive load often generates high peaks of voltage which may damage semiconductors used in SSRs (which causepremature aging of relays) and breaking of protection devices. 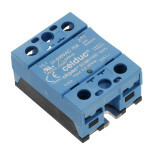 A peak starting relay allows the starting current of the transformer to be reduced. So our new SOP range is designed for the start-up of transformer primary circuits and all satured inductance coil loads preventing magnetising current peaks.